This peak is remarkable for its wave-like profile when seen from near Ballintrillick. However, it is probably its resemblance to a leaning haystack which accounts for its name. Ir. miosgán is cognate with Welsh misgawn/meisgawn, which has this meaning. Benwiskin is the 523rd highest place in Ireland. 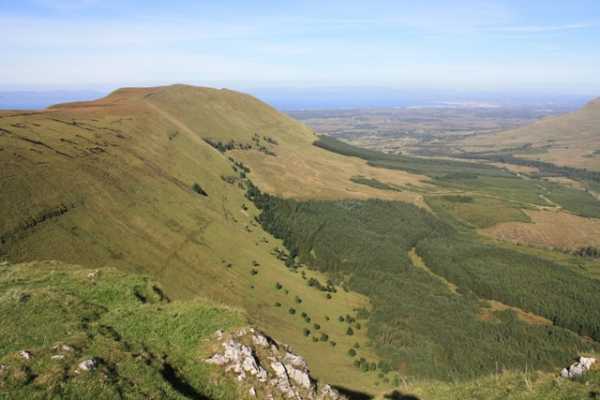 I followed eflanaga's route taking in Benbulbin, Benwiskin and Slievemore. It was a long hike and I measured it at about 20 kms return. After chatting to a family on Benbulbin for a few minutes I didn't see another person for the rest of the day. The walk to Benwiskin is long and hard, with rough ground and a lack of a path. I was tired when I reached Benwiskin, and there was still the return journey! The views were stunning, especially along the cliffs from Slievemore to Benwiskin. I was quite alert for angry farmers as I neared Benwiskin, but I never met a soul. The summit of Benwiskin still has the unused spars and rolled up fencing referred to by gerrym a year ago. Something that struck me was the hundreds of holes across the bog all along the route. It is like the ground collapsed, leaving behind holes everywhere. Many of them are only a few feet deep but quite a few are 10 feet or deeper. Most have gradual slopes, but more than a few were steep and dangerous looking. One at G726 463 G was about 20 feet deep with steep sides. Be warned!